Vericom Double Hinge Swing Out Wall Mount Cabinets are a great solution for networking, security, and AV installations where access to the back of the equipment is important.Compatible with all standard 19-inch EIA equipment, these cabinets feature a swing-out design that also allows the rear section to completely disconnect from the cabinet, making installation a breeze. 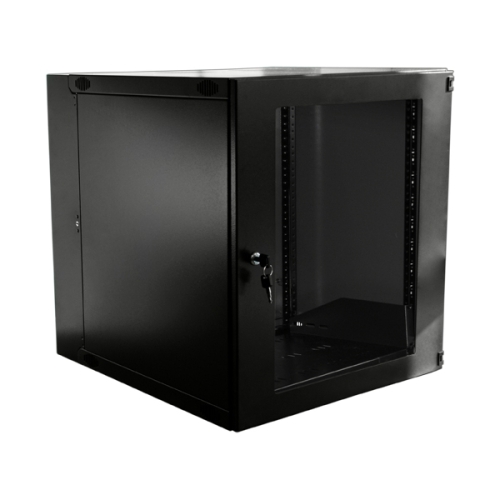 Constructed of cold rolled, powder-coated 19-gauge steel, these swing out wall mount cabinets have a maximum load capacity of 100 pounds and are available in 9U, 12U, and 15U racking heights. Ships unassembled and flat packed for easy on-site handling.